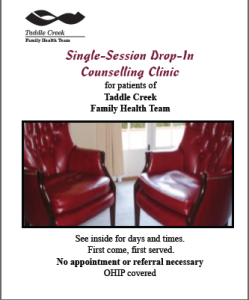 Taddle Creek FHT offers Single-Session Drop-in Clinic for patients who have an issue or concern and who need to speak to a counsellor. This service is a single-session only. For ongoing counselling sessions, you should speak to your primary care provider to discuss other options. On Tuesdays, please check in with Reception at 726 Bloor Street West, Suite 207. The clinic runs from 1:15 pm to 3:15 pm. You will be seen on a first-come, first-served basis. We ask that you arrive by 1:45pm at the latest. On Fridays, please check in with Reception at 790 Bays Street West, Suite 306. The clinic runs from 9:00 am to noon. We ask that you arrive by 10:45 am at the latest. On the rare occasion that we have an unusual number of clients arrive on the same day, you may need to come back on the next week of the clinic.